As per a study, 50 percent of people in Western Europe and North America are suffering from dandruff. It is a chronic scalp condition is caused by fungus called Malassezia. It generally lives on our scalp and feeds on the oils produced by the hair follicles. Hormonal changes, stress, sensitivity to certain products and pollution can aggravate the fungus which lets the scalp to produce more skin cells. These extra skin cells die off quickly and appear as white flakes. Though it is not harmful or contagious, it is very difficult completely stop it. However, the symptoms like flaking and irritation can be greatly controlled with baking soda due its natural cleansing and pH balancing properties. These two properties are not available in most of the dandruff shampoos that is why they don’t provide any results. Does Baking Soda Really Work for Dandruff? The natural cleansing and gritty nature of baking soda exfoliates the dead skin cells, dirt, and other impurities from the scalp. Its absorbing property clears the excessive sebum or oil from the scalp without causing excessive dryness. It balances the pH level of the scalp which creates an unhospitable environment for fungus to go out of control. Quick Tip: Baking soda acts a natural dry shampoo which makes your hair soft and shiny. 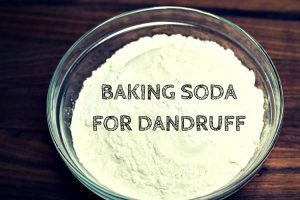 How to Use Baking Soda to Get Rid of Dandruff? Here are the best 10 remedies using baking soda for treating dandruff. By following any one of them regularly you can wave a good bye to the embarrassing flaking and itching. This combination effectively exfoliates the white flakes and reduces the itching. It is one of the easy ways to treat dandruff quickly. Mix baking soda and rosewater to make a paste. Apply the paste on the scalp and massage gently in circular motions for 2 minutes. Wash your scalp and hair with cool water. Follow the method twice in a week. Note: Avoid shampooing while rinsing off the application as baking soda itself acts as a shampoo. The natural astringent properties of lemon deal with the fungus. This combination not only exfoliates the white flakes but also provide natural shine to the hair. Combine enough amounts of baking soda and fresh lemon or lime juice. Apply the mixture on the scalp thoroughly. Gently massage in circular motions for 2 minutes. Let the paste stand on for 5 more minutes. Rinse your hair with cool water and towel dry. Note: You can also use calamansi instead of lemon. This process is one of the easy and effective ways to prevent dandruff from recurrence if followed regularly. Make sure to use only herbal shampoo for this process. Take enough amounts of herbal shampoo usually required to wash your hair. Add 1 teaspoon of baking soda into it and mix well. Use this mixture to shampoo your hair normally. Wash your hair with water several times. Repeat the process whenever once or twice in a week. Mix baking soda and apple cider vinegar to make a paste. Apply the mixture on scalp and massage gently to scrub away dandruff. Follow the process twice a week to minimize dandruff. Though the origins are not known, beetroot juice is one of the oldest tricks to keep the dandruff at bay. Apart from that, it also provides a very nice shine to the hair. Apply it thoroughly on the scalp and massage gently for 2 minutes. Now, apply fresh beetroot juice to the scalp and hair. Leave it on for few minutes and rinse off with cool water. Continue following this process 2 times in a week until the dandruff clears. This combination has been very effective in exfoliating the dandruff, soothing the itchy scalp and leaving a fresh fragrance to the hair. Mix baking soda and freshly extracted mint juice to make a thick paste. Apply the paste on scalp and leave it on for few minutes. Now gently massage the scalp to loosen the dead cells. Follow the method twice a week to clear the dandruff. Ginger restricts the growth of yeast and reduces the other discomforts caused dandruff. It promotes proper blood circulation and moisturizes the scalp. In a clean bowl, combine 1 teaspoon each of baking soda and ginger juice. Add few drops of water and mix well. Leave the application for few more minutes and rinse off with cool water. Repeat the process once in a week to treat the dandruff. The excellent antiseptic and anti-fungal properties of holy basil kill fungus, soothe the itching, and discourage the growth of fungus on scalp. Wash and blend 1 ½ cup of fresh basil leaves into a smooth paste. Add 1 teaspoon of baking soda to the paste and mix well. Apply the pack on the scalp. Leave it on for few minutes and rinse off with clean water. Coconut oil contains emollient and humectant properties. It provides relief from dryness and itchiness caused by dandruff. Honey possesses antioxidants which reverses the damage caused by free radicals. Combine 1 1/2 teaspoons of baking soda, 1 tablespoon each of coconut oil and honey. Mix well and apply the mixture on the scalp. Leave it on for 20 – 30 minutes and rinse your hair normally. Olive oil is helpful in conditioning and moisturizing the scalp. The egg yolk nourishes the scalp and provides shine to the hair. Slightly warm 1 tablespoons of olive oil. Add 1 teaspoon of baking soda and 1 egg yolk into it. Mix well until the ingredients incorporate together. Apply the mixture on the scalp and Leave it on for 20 minutes. Rinse with cool water and towel dry. Repeat the process 2 times in a week for at least a month to notice the improvement. Tea tree oil contains antibacterial and antifungal properties. Adding to baking soda helps to speed up the process of treating the dandruff. Into 1/2 cup of water, add 2 teaspoons of baking soda and few drops of tea tree oil. Repeat the process 2 times in a week for at least a month. Make sure to use the baking soda in limited quantities and avoid leaving it on for a longer time. As in either cases, the hair or scalp get damages. After following the method, rinse your hair well to remove traces of any baking soda. Avoid trying any method mentioned above if you have open wounds or sores on the scalp. While trying baking soda remedy, your hair may feel dry initially, but over the time it will regain the moisture. Drink plenty of water to maintain the scalp hydrated. Avoid using chemicals that contain harsh chemicals like paraben or sulfate. Avoid using hair styling products until the dandruff gets cleared. Avoid scratching the scalp as it can worsen the problem and cause infections. Include zinc, magnesium, probiotics and omega fatty acids in your daily diet. Apart from treating dandruff, these remedies can also improve hair growth and health. Just one thing you have to remember is you will not achieve results overnight. However, with some patience and regular follow up you achieve the results in some time. Have you ever tried using baking soda or other home remedies for treating dandruff? Share your experience, suggestions and queries in the comment section below. Is baking soda and baking powder same ? No, baking soda is different from baking powder. Avoid using baking powder. Use baking soda for home remedies. How much baking soda and lemon juice do I use? You can combine 2 tablespoons of baking soda and 1 tablespoon of lemon juice. Add some water to the mixture if it is causing burning sensation. Can i use paste of baking soda lemon jiuce and few drops of rose water do regularly. is it useful or harmful for hair…..? Baking soda and lemon juice can be harmful to your scalp and hair if used daily. Our scalp is sensitive to deal with the harshness of baking soda and citric acid of lemon. So repeat the process once in a week. Mix baking soda and water to form a thick paste. Apply it on the scalp and leave it for 3 minutes. Rinse off with water. what if i jus mix baking soda and water only but i skip lemon juice or rose water? will it still help? It will help. Give it a try and let us know your experience. Can we use baking soda with apple cider vinegar on daily basis . Daily application of baking soda and apple cider vinegar can be harsh on your delicate scalp. Limit the application to 2 times a week. Can we apply baking soda without any thing n can we use it daily n for how much time. Using baking soda daily can hurt your scalp. So we recommend using not more than 2 times a week. As everyone is different, it is not possible to tell the exact time frame so try the treatment until you find the results. No, don’t use baking soda daily on your scalp as the harshness of it can damage the skin. Use it not more than 2 times a week. Yes, if followed regularly it removes the dandruff completely. How many weeks can we use this methor? (Any one of the list) Or is it possible to use this until dandruff free? Repeat the process 2 times a week until the dandruff is completely cleared. shall i use shampoo after the application of baking soda & lemon juice? No, don’t use. Baking soda itself acts as shampoo. I know I can’t use shampoo after applying baking soda but can I use conditioner? Thank you to whoever will answer. yes, you can use conditioner but don’t apply conditioner on the scalp. how much rosewater and baking soda do I use to make the paste? Take 3 tablespoons of baking soda and 2 tablespoons of rosewater to make paste. after using baking soda on my scalp wtith lemon juice…can i shampoo my hair or should i use conditioner.pls explain.becz i was confuse of previous replies i read..
You have to just use plain water to rinse your hair. Baking soda itself acts as a shampoo. You can apply conditioner to your hair. But don’t avoid applying conditioner on the scalp. Is baking soda suitable for oily hair. .? can we use oil after or before using baking soda. ? It is better to apply baking soda on hair without oil. You can use coconut oil after baking soda treatment. Its greasy if I don’t wash my hair with shampoo ! Can I use a milder shampoo after baking soda and vinegar ? you can use mild shampoo or baby shampoo, if you hair is still greasy after the treatment. Why can’t we shampoo our hair after using this treatment ? What will happen if we do so ? Baking soda itself acts as shampoo so we don’t recommend using shampoo after the treatment. If you wash your hair again with it will dry out the scalp and disturbs the pH balance. Hi, is it advisable to use a conditioner after using any of this methods to clean the hair? You can use a mild conditioner but apply it only to hair ends. Can i use Oil after using any of above methods to clean the hair & will it Stop Hairfall ??? Yes, you can. It can helps in stopping the hair fall. Apart from trying out the remedy regularly, you have to eat nutritional food, avoid hair styling products and drink plenty of water to keep scalp hydrated. Is this safe for color treated hair? I assume the rose water would be ok but lemon juice makes me think of lighter shades of blonde. I have light Browne, dyed to a burgandy with black highlights. It’s hard enough to keep it from fading as it is. Just want to make sure,.. thanks for the tips! As lemon contains bleaching properties, it may lighten or discolor your colored hair. So it is better to avoid it. Which one is better herbal shampoo+baking soda or lemon juice+baking soda??? Both are good combination, so it is difficult to choose among them. The combination which works for me may not work for you and vice versa. So, choose any one of them as per your convenience. May i ask one question , Can you suggest methods for hair loss? if yes please tell us procedure. Which one is better baking soda+herbal shampoo or baking soda+lemone juice???? Both are effective. You can choose any one as per your convenience. Should hair be wet first? Not required. It is not necessary for the hair to be wet. How do I make the paste with Baking Soda and Apple Cider Vinegar? And does this treatment remove the dandruff completely? Combine 2 tablespoons of baking soda and 1 tablespoon of apple cider vinegar to make a paste. Apply the paste on the scalp and message gently. Rinse with cool water. You may not see results overnight but by following the process 2 times in a week for a month you will notice the improvement. How much quantity of leamon and soda should be used? The baking soda and lemon ration should be in 2:1 ration. For example if you take 2 tablespoons of baking soda then add 1 tablespoon of lemon juice. Don’t use baking powder instead of baking soda in the above mentioned methods. If you want to use baking powder then mix it with enough amounts of water to make a paste. Apply the paste on the scalp and massage for few minutes. Rinse off with water and pat dry. Repeat the process 2 times in a week. Is it alright to shampoo your hair after using any of the methods (except #1)? Or should I just rinse it off? You can just rinse it off but if you want to use a shampoo, then we would recommend to use a mild one. With this baking soda + leamon juice paste, essential oil like olive/coconut oil can be added and helpful? Yes, you can add any essential oil to boost the effectiveness of the mixture. Yes, it is ok. Try it and share your experience with us. Yes, lemon and baking soda can affect the natural hair color if the left on hair for a longer period of time. So, we recommend leaving it no more than 5 minutes. Yes, fenugreek is also effective in dandruff and hair loss. I have really bad scalp pimples and redness will this help? Yes, it helps. Try it and share your experience with us. Can i use onion juice and baking soda? Yes, you can. Combine baking soda and onion juice to make a paste. Rub the paste on the scalp for few minutes. Leave the application for 5 – 10 minutes and rinse thoroughly with water. Repeat the process twice in a week. How long should I use this remedy ? I used on my daughter’s scalp but her dandfuff comes back very next day when she applies hair oil on her hair. Can u tell me what I m making mistake? Dandruff cannot be removed completely in a single wash or overnight. It takes some time to completely remove it. Choose any method mentioned above in the article and try it regularly until you achieve the results. Apart from that try to change the oil you have been using and make sure your daughter drinks plenty of water. I have got some pimples or you can say wounds inside my hairs, will baking soda remove it permanently?? Would baby oil and baking soda work for dandruff and scalp, if I don’t have none of the above. All I have is baby oil and baking soda. Is it wisr to apply d mixture on a hair that is being washed with hair darking shampoo.Do i have to wet my hair before applying the paste? What shampoo should you use between the treatments? Can i use rose water and baking soda for dandruff?? And when do i have to apply?? After washing hair or Before?? You said the combination of baking soda , coconut oil and honey can cure the dandruff. But applying honey can cause the grey hair ?? Is it true ??. Can I use dandruff shampoo with baking soda or only herbal shampoo and baking soda?? Can I just use baking soda just by itself on my hair ?